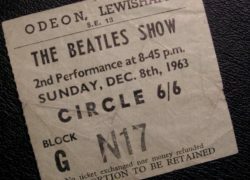 Item description: The Beatles Show 8th December 1963 at the Odeon, Lewisham. Mint green paper ticket with black printing. Condition report: Some creasing, otherwise very good condition. Background to The Beatles 8th December 1963 concert at the Odeon, Lewisham: On 29th March 1963, The Beatles played at the Lewisham Odeon. They were on tour with Chris Montez and Tommy Roe – in fact they weren’t even mentioned on the ticket. Their setlist on this tour contained six songs: Love Me Do, Misery, A Taste Of Honey, Do You Want To Know A Secret, Please Please Me and I Saw Her Standing There. 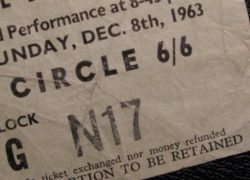 By the time they returned to the Lewisham Odeon on 8th December 1963, Beatlemania was in full swing. In fact when tickets for the show went on sale a couple of weeks before, police had to hold back the crowd.